[Satnews] EDRS-A, the first relay satellite of the SpaceDataHighway, was successfully launched into geostationary orbit on January 30, 2016, hosted by the EUTELSAT 9B satellite via an International Launch Services Proton launch vehicle. After a test period, this satellite will become operational for its first end-user customer by mid-2016. The SpaceDataHighway system will provide high-speed laser communication in space at up to 1.8 gigabits per second. This major program, which cost nearly 500 million euros to develop, is the result of a public-private partnership (PPP) between the European Space Agency (ESA) and Airbus Defence and Space. As lead contractor of the EDRS-SpaceDataHighway PPP, Airbus Defence and Space not only co-finances, owns, manufactures and operates the system but as well commercializes it. The German Aerospace Center (DLR) is also significantly participating in financing the system and also in the development and operation of the ground segment. Overall, eleven European countries are involved in the consortium. Artistic rendition of the EUTELSAT 9B satellite. Image is courtesy of European Space Agency and Airbus Defence and Space. The first communication node of the SpaceDataHighway system, EDRS-A, is a hosted payload carried on Eutelsat 9B, a Eurostar E3000-type satellite built by Airbus Defence and Space and to be operated by Eutelsat. EDRS-A will be positioned at 9 degrees East and will be able to establish laser links with orbiting observation satellites and UAVs positioned over Europe, Africa, Latin America, the Middle East and the eastern coast of North America. A second satellite will be launched in 2017, which will extend the coverage, capacity and redundancy of the system. Airbus Defence and Space and ESA are looking for partnerships to further expand the SpaceDataHighway by 2020, with a third node to be positioned over the Asia-Pacific region. The Pacific Rim region, for instance, has witnessed a dramatic rise in the communication needs for airborne missions. As part of the Copernicus initiative, the European Commission is the anchor customer for the SpaceDataHighway. Its use will allow the Sentinel-1 and Sentinel-2 satellites, all equipped with laser communication terminals, to significantly accelerate the delivery of time-critical and large volumes of data to Earth monitoring centers. In case of crisis or natural disaster management, up-to-date, near real time information is crucial for the authorities to prepare the most appropriate emergency response. “SpaceDataHighway is no longer science fiction. It will revolutionize satellite and drone communications, and help to keep the European space industry at the forefront of technology and innovative services,” said Evert Dudok, Head of the Communications, Intelligence & Security (CIS) business line at Airbus Defence and Space. International Launch Services (ILS) successfully placed the EUTELSAT 9B satellite into geosynchronous transfer orbit, for Eutelsat Communications of Paris, France. With this mission, ILS completed its 92nd Proton launch overall and 1st Proton launch of 2016. Since its maiden flight in 1965, this was the 410th aggregate launch for the Proton vehicle, including both Federal and commercial missions. The launch of EUTELSAT 9B, built by Airbus Defence and Space, was conducted for Eutelsat using the Proton Breeze M launch vehicle, manufactured by Khrunichev State Research and Production Space Center (Khrunichev), the majority owner of ILS and one of the cornerstones of the global space industry. The Proton Breeze M vehicle carrying EUTELSAT 9B launched from Pad 39 at the Baikonur Cosmodrome, today, at 04:20: local time (22:20 GMT and 17:20 ET on January 29). The first three stages of the Proton used a standard ascent profile to place the orbital unit (Breeze M upper stage and the EUTELSAT 9B satellite) into a sub-orbital trajectory. The Breeze M performed planned mission maneuvers to advance the orbital unit first to a circular parking orbit, then to an intermediate orbit, followed by a transfer orbit, and finally to a geosynchronous transfer orbit. Separation of the EUTELSAT 9B satellite occurred 9 hours, 12 minutes after liftoff. 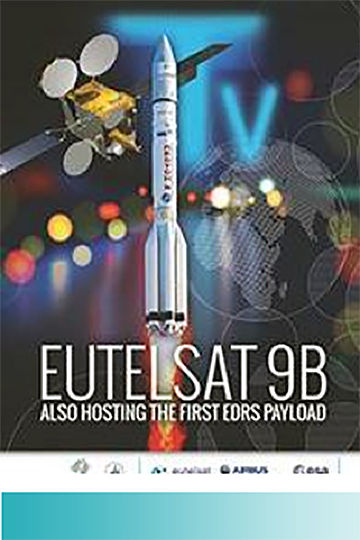 EUTELSAT 9B is a high-capacity 56-transponder Ku-band satellite for Eutelsat’s 9 degrees East position. Capacity will be spread across five footprints, with frequency reuse optimizing overall bandwidth. EUTELSAT 9B will address high-growth digital TV markets through one pan-European footprint delivering wide coverage and four regional footprints. EUTELSAT 9B also hosts the first data relay payload for the European Data Relay System (EDRS) being implemented through a Public Private Partnership (PPP) between ESA and Airbus Defence and Space. "Our congratulations to ILS and Krunichev for today's flawless launch that sees a new Eutelsat satellite propelled on its way to geostationary orbit. This sophisticated satellite program reflects outstanding collaboration between Eutelsat, ESA, Airbus Defence and Space, ILS and Khrunichev. We look forward to putting EUTELSAT 9B to work for the benefit of our broadcaster clients and to the inauguration of the ground-breaking European Data Relay System that illustrates the complementary programs of geostationary and Low Earth Orbit (LEO) satellites for fast transmission of data flows back to Earth," said Michel de Rosen, Eutelsat Chairman and CEO.